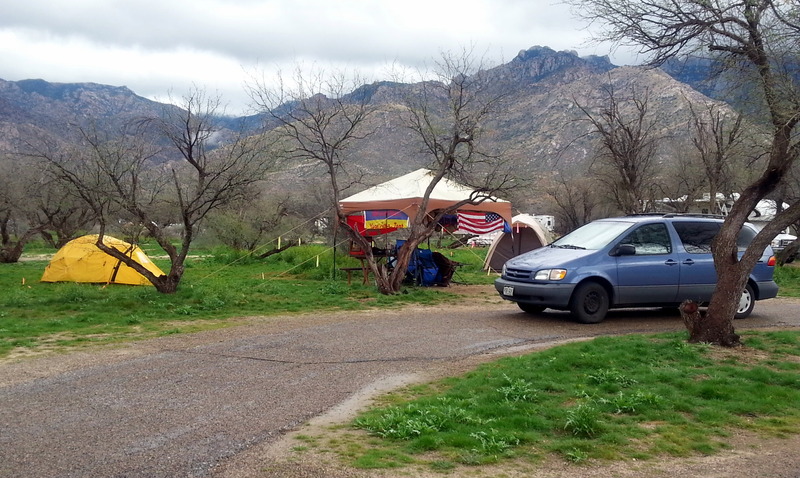 Well, it’s been interesting, to say the least, since we left Lost Dutchman State Park on Thursday. 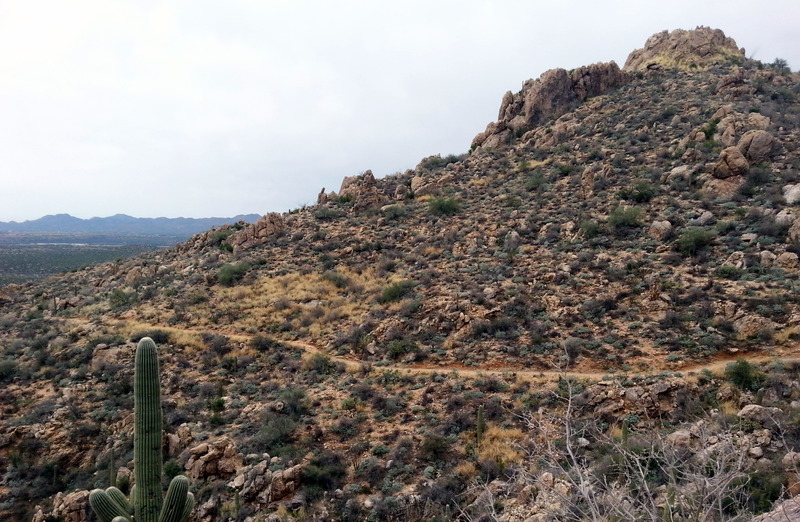 We were delighted to find that the best route to Catalina State Park in Tucson would keep us off the Interstate. That always makes for a good day. After a decent breakfast at the Hoosier Cafe, we hit the road. 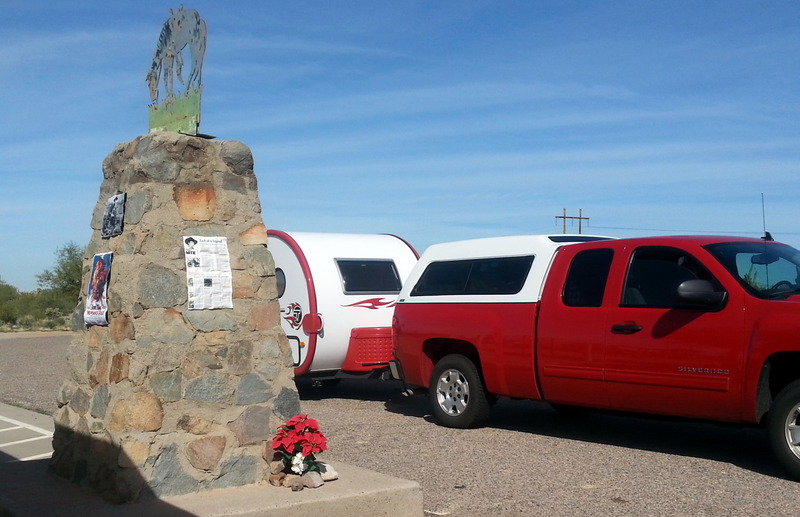 Our route took us through Florence, AZ, which must be the Prison Capitol of the state! Razor wire everywhere. Interestingly enough, this was where John’s dad spent a good portion of his WWII military service. German POWs were held at the base in Florence, where Frank was a truck driver. 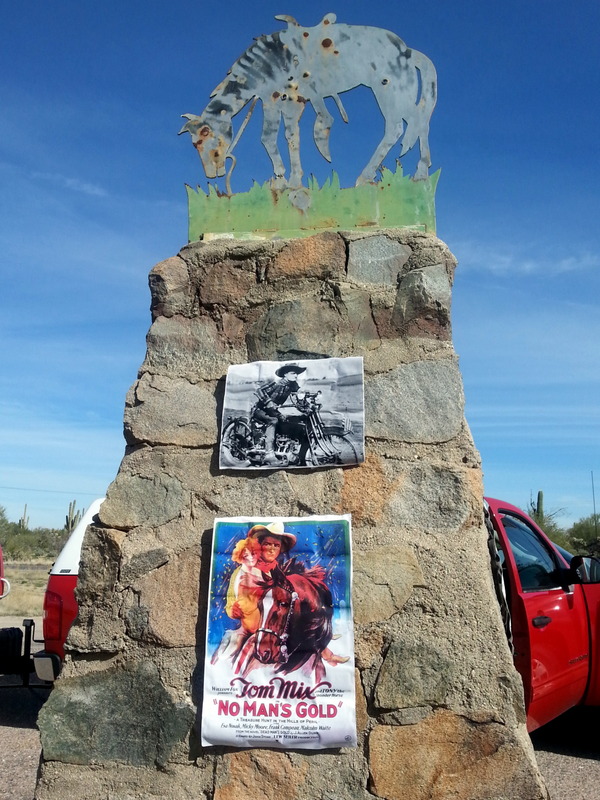 Just a ways down the road, we saw a sign for the Tom Mix memorial. Check it out? Of course! Turns out that this famous film cowboy was killed in a car accident here in October, 1940. His horse, Tony the Wonder Horse, died exactly two years later. What I liked most about this whole tale was the fact that Mix had been playing poker with Scotty (of Scotty’s Castle, Death Valley fame) earlier on the day of the crash. Some reports said his car was filled with cash and jewelry, other reports said that was untrue. Interesting spot for a ten-minute break. We’ve got a pretty good spot at Catalina, although we’re dismayed by the unkempt appearance of the Park. Perhaps we’ve just been spoiled by the immaculate conditions at Dutchman, but all we see are weeds grown too high, dirt and sand. Disappointed to see no fire pits here at all. Hard to sit outside in the cold, dark without fire. Storms are predicted for the next couple of days, so we deploy our big awning. It’s nice to be able to sit outside in the rain. 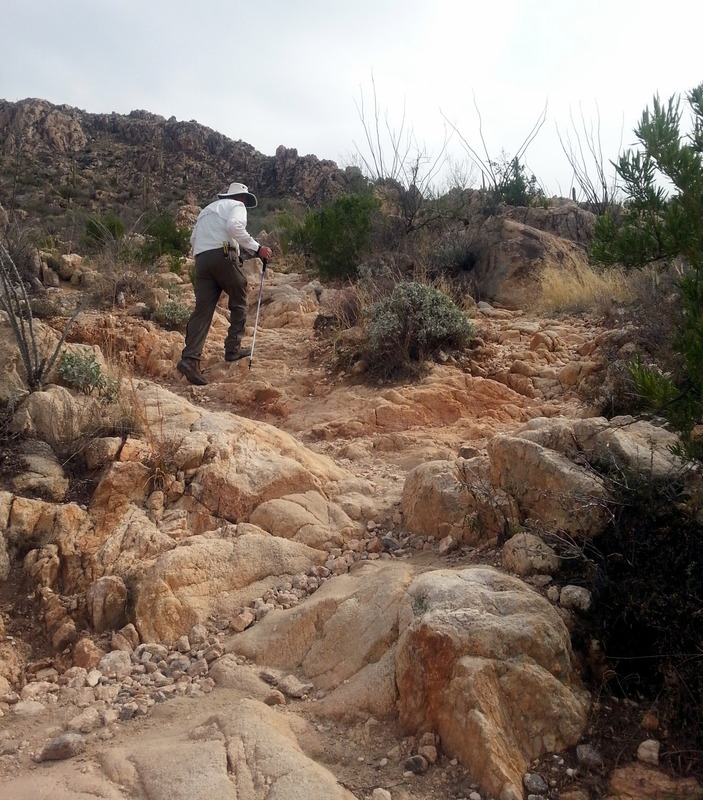 Thursday looks to be the only dry day, so we decide to hike to Romero Pools, roughly a six mile round trip. Of course, it starts off uphill, which tests our still-tender Flatiron muscles. This is a gorgeous trail, with many beautiful views. 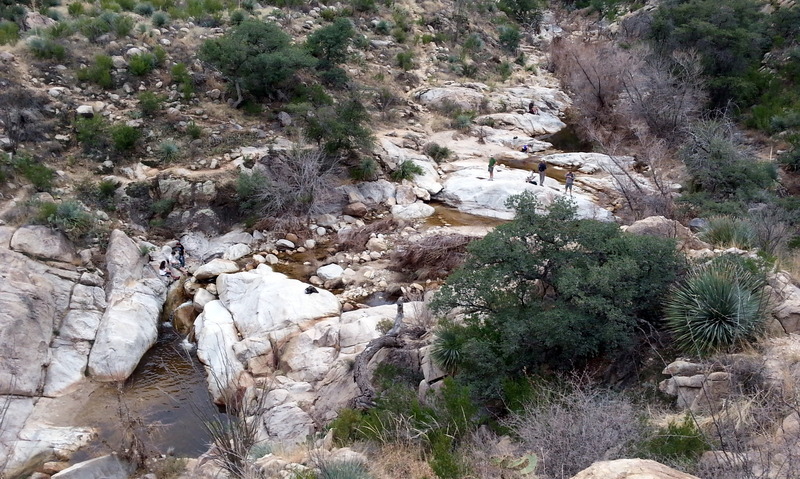 A steady stream of downhill hikers gives us a bit of encouragement that we may have the Pools area to ourselves. Turns out to be nearly so. Our friend Vern invited us to dinner at his Tucson home. Such a treat not to cook our own food after a tiring hike. We feasted on carne asada, with some terrific tortillas, chips and guacamole. It was wonderful to be in a home, with all that comfort and warmth. The patio fire pit was perfect. Weather trouble began brewing later that night. Rain, sometimes really pounding, battered us. Knowing that we’d be spending lots of time inside the Fireball, we decided to do some much needed grocery shopping. Once we got back to camp, the pounding began. Yikes! By 6pm, we had received nearly an inch of rain. Doesn’t sound like much, but this hard desert surface in a mountain valley has nowhere to put all that water. 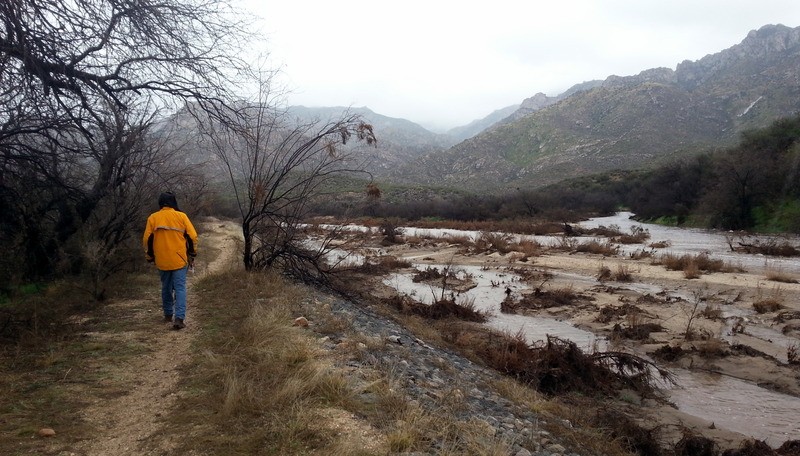 Late Friday night, we could hear it pouring downdown the mountains into the wash.
Saturday, we awoke to find ourselves marooned in Catalina SP. The only road out was covered with about a foot of water, over the top of a couple feet of sand, which totally obliterated the road. The water was really rushing past. It was fascinating. We hiked to the Trailhead, to find it nearly unrecognizable. 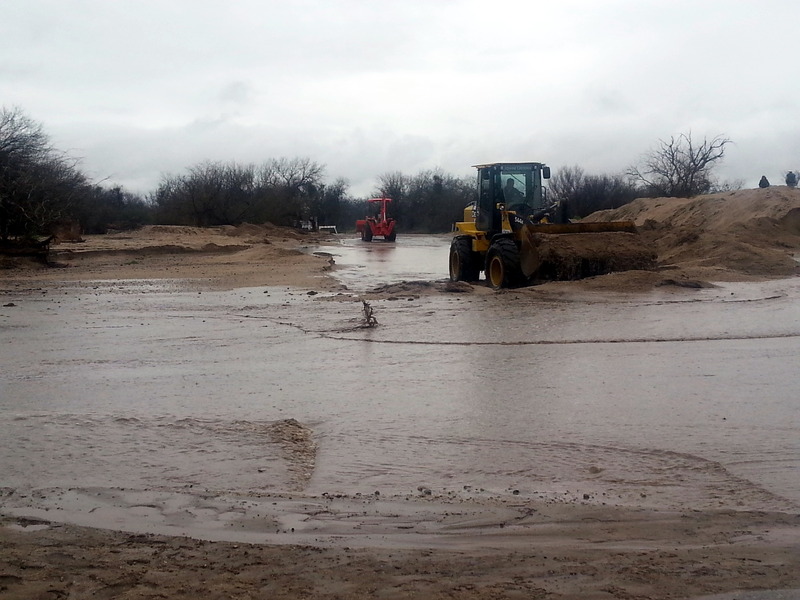 Anyway……long story short….heavy equipment was brought in, and tons of sand were scraped off the path. A few vehicles escaped, mostly 4wd. One incoming vehicle got stuck (much to the delight of the many spectators), but eventually got himself and his rig across. We stood in the rain for three hours, watching the spectacle of the earth movers and trucks trying to unbury our road. High drama + high comedy with the impatient drivers thrown in. In any case, we believe well be able to leave Sunday, as planned. 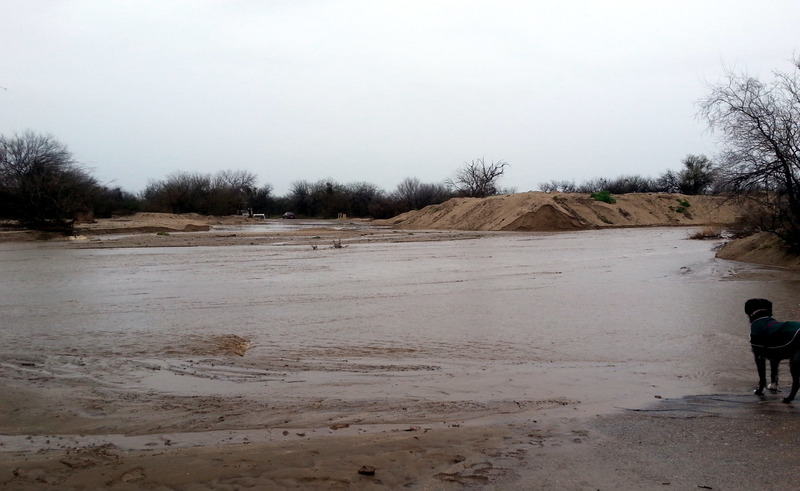 lt finally stopped raining around 6pm, so the water should recede. The road crew will start work early to scrape all the new sand off to open one lane. If you never see this blog again, we didn’t make it. Otherwise, I’ll check in sometime next week. Me: Are you the One Year in a Tent guy? OYIAT Guy: Yep, that’s me! Me: So, what’s that all about? OYIAT Guy: Well, I started on a very appropriate day last year. Want to guess when that was? OYIAT Guy: Nope, April Fool’s Day! Me: Wow. Then you’re almost done. OYIAT Guy: Last night was Day 227. I only count the days we actually sleep in the tent. Me: Open mouth, stupid look. Am I out of line here? Doesn’t One Year In A Tent mean 365 consecutive days? PLUS, he’s running a generator in his tent!!!! Get out, OYIAT Guy. You are a fraud. I am so done with you. It’s 10:30pm, and is has started to rain again! Damn! That wasn’t supposed to happen. Hope it’s just a gentle shower. We’ll see….. 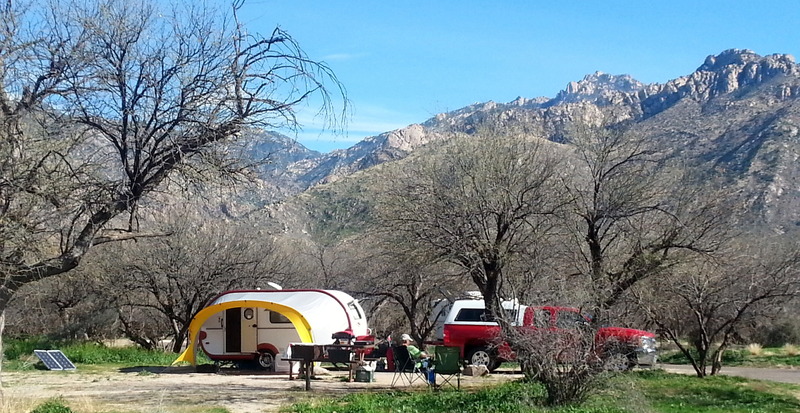 This entry was posted in Arizona, camping, great outdoors, hiking, retirement, road trip, RV life, simple camping, state parks, T@DA, weather and tagged Arizona, camping, Catalina State Park, hiking, retirement, road trip, simple camping, state parks, T@DA, the great outdoors, Tom Mix by Judy Crankshaw. Bookmark the permalink. My signal is too poor to load the photos, but your account of the rainstorm was gripping. Scary even. We were in Tucson 2 years ago when it SNOWED. It was a rare treat and it was interesting to see the ribs on the saguaros swell from the moisture. The desert seems to come alive after a good dumping of moisture. Wildflowers should start showing up around AZ by the end of February with some yellows. I think the Ocotillo cactus and prickly pear will also start blooming. Just depends on temps. We saw a bit of snow in Tucson as well a year or two ago. It was hilarious – as we exited Costco, people were running around the parking lot with their cellphones, taking photos of trees stacked with study, wet snow. We usually saw some ocotillo flower, and a bit of prickly pear, bit I would love to be around one time to see the saguaros flower. I hear they are spectacular. I do think this wet weather will force many of the mesquite to leaf out. Goof thing, IMHO, as they are not the most attractive skeletons! Weather forecast looks really nice for the next 10 days. We are ready to dig in and enjoy it. Thanks, Ingrid. Hope your travels are going well. Wow! What an adventure! Some day you will look back and marvel at your trials. 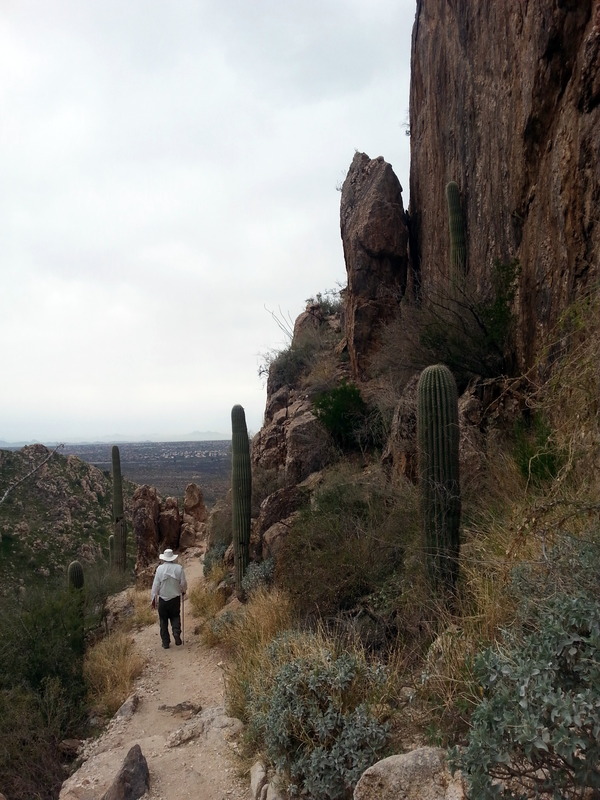 The hiked looked beautiful…will keep it in mind. Hope this is the end of the rain…for now. 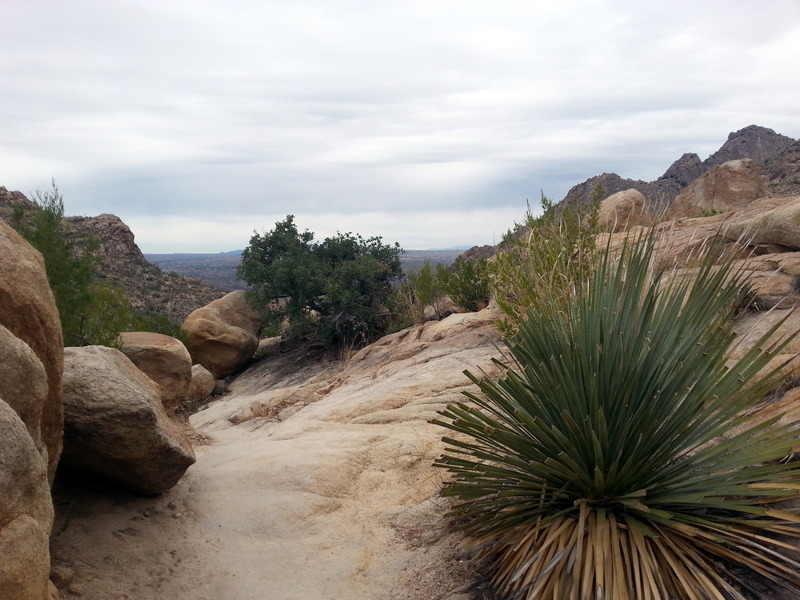 Romero Pools is a really nice hike. Nothing too challenging, just a great walk with a nice spot for lunch. I’ll take snowstorms any day over rain, flooding and washed out roads. The scenery is gorgeous but the “river that wasn’t the day before” reminds me why I moved away from AZ. Nice place to visit but. . . . . .the picture of Jezzy watching the water could be captioned WTH! May your next adventure be less dramatic. Storms here are all about the drama. 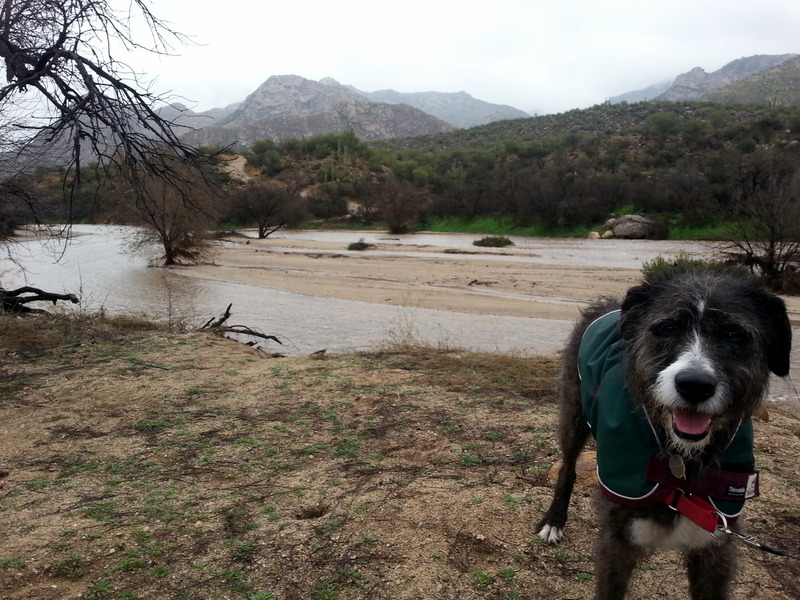 This was the most rain ever in 24 hours for Tucson. Made for an interesting day, and there sure was lots of excitement in camp. Phoenix has the Super Bowl. We have the Super Washout. I suppose that there are worse things than being stuck in a campground for a while, but it would have been nicer if the campground had been better maintained. In spite of your current predicament, I’m still loving the Arizona scenery more than I thought that I would. Also, I’ve heard that the desert comes alive in wildflowers after a rain, so maybe you’re in for a real treat? The guy in the tent sums up our culture these days, just come up with a gimmick, honesty doesn’t matter. We can see even a bit of greenish color on the mesquite trees – a change in the last few days. I’ve never been here when the desert blooms – usually this happens in late April/May, and we are long gone by then. I did see an enormous Jerusalem Cricket the other day (looked it up). Thought of you, and wished I had my camera. He was just lumbering along the pavement. Morning! What a cliffhanger! So, Judy, if you don’t make it out can we inherit the movie rights to your blog? Can’t decide whether to cast your role with Tina Fey or Amy Poehler. Of course, Jennifer Lawrence will be Judy, the early years. We’re still working on John as we sip coffee looking out on the Caloosahatchee River from our cozy silver shack. Buena suerte! So flattered. Can’t imagine Tina or Amy as me……perhaps Jamie Lee Curtis? Let me know who you decide for John. Movie rights are yours! Hope to catch up with you sometime this year. Sounds like more of an adventure than you bargained for at this park. I hope the new rain didn’t last long and that you are indeed able to get out today! What a mess! I’m with you regarding the tent guy. Very misleading flag! Gets him a lot of attention I presume. Good luck today (Sunday). Waiting for your next post!!!! John and Jezzy are checking the road out now. Sun is actually up and shining. First time in days! I’m optimistic. We shall find out shortly. Internet here is good. Guess we can text for a tow if we have to. Glad to see your blog. Looked for it the other day, but guess I was still looking under the old names, so didn’t find all the new stuff. Florida sure is flat! Happy travels. (Please eat one of those wonderful-looking seafood salads for me next time, too).